Two transport planning apprentices from Leeds College of Building will have their work published in a national magazine having each won a coveted award from the UK association for the promotion of Intelligent Transport Systems (ITS-UK). First year student at Leeds College of Building, Daniel Johnson, took first place in the national competition for his essay, ‘A tale of unexpected adventures in ITS’, and second year student, Joel Shevlin, won second place for his essay, ‘Dynamic Lanes’. The annual competition has been running for 17 years and aims to support the development of ITS technologies. 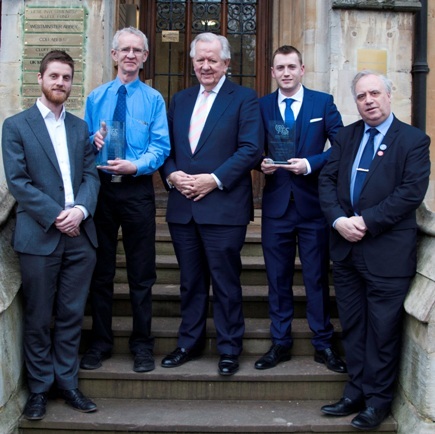 The Leeds College of Building apprentices beat several other competitors from across the country to achieve the awards. Marks were given for knowledge of new and developing technologies, innovative ideas, and for good presentation and writing style. Dr Paul Firmin, lecturer in transport planning at Leeds College of Building, said: “I am highly delighted with the great successes achieved by two of our transport planning apprentices in the recent ITS UK apprentice essay awards. “Daniel and Joel’s achievements mean that Leeds College of Building’s students have claimed the top two steps of the podium in this national essay writing competition, which is the first year the competition has been opened up to apprentices, as well as undergraduate and masters students. “The students attended a ceremony in London and the winning papers have been published in Smart Highways magazine. We have now set a precedent, and they have inspired our current two cohorts of transport planning technician apprentices to all have a go at the awards next year. The transport planning course launched in 2016 and currently has 75 apprentices working towards a Level 3 BTEC Diploma over a two to three year time-frame, whilst working in the transport planning industry. On completion of the course they can achieve Eng Tech status and then progress to a relevant degree or higher apprenticeship.